Thus Les Tambours du Bronx gives meaning to the phrase « living art » : energy, flow, life itself emerge from the sound of this 16-head band which, far from leaving you unmoved, is fascinating and overwhelming. Their number, their passion and their influences sculpt an energetic sharp music mingling rock, indus, techno and afrobeat and blending synthetic sounds and samples. A collective production of gestures and fever, a choreography in which strength intensifies, the tempo is electrified, voices turn into shouts, all of it in a violently aesthetic cohesion. Being there, whole, standing and striking the iron as though they were going to die tomorrow. And starting all over again. The sight of bodies heating up in the mechanics of a rhythm oiled to perfection is hypnotic and the show is cathartic. The audience and Les Tambours are interactive, the one feeding the others. The audience is indeed their capital. Exhaustion has vanished, each musician acting, striking, shouting with the energy of a transcended audience. The music becomes flesh and one exults with Les Tambours. For 28 years, this 16-head industrial monster has been spreading its rage and its song over every continent. This herd of individualities has irrigated every country with its sweat, this horde with its animal-like look has raged on every stage. The United States, Brazil, the Arab Emirates, China, Morocco, Tunisia, Hong-Kong, Greece, Reunion, the Republic of Djibouti, Egypt, Norway, Slovenia, Portugal and the whole of Western Europe have experienced their music and their fiery temper. Fukushima mon amour (2011) recounts this first quarter of a century of Les Tambours du Bronx, these twenty-five years of shows, of roads, of anger and of encounters : the life of an atypical and independent band. Their first performance was to be a single event : for 28 years the exception has been replayed every night. Les Tambours du Bronx was born in 1987 in Varennes-Vauzelles, a small town near Nevers (Nièvre). A district of railway and other workers, this local Bronx gives birth to a bloc, a pack amidst the machines. The rhythm of the factory and workshops will be its tempo. The grid street layout will become a pattern and the music will proceed from their raw material, metal. Oil-drums, pick-axe handles : being radical is indeed « starting from the root ». Now Les Tambours du Bronx rediscovers its roots. The band brandishes the emblem of its origins, the rhinoceros and goes wildly back to its roots. With Corros the tenacious anchored beast merges with the raven, the mythical bird with the harsh scream. This bestiary inaugurates a new scene and heralds a new century. 1987 : birth of the band. 1989 : band revealed by Jean-Paul Goude on the occasion of the Bicentenary of the French Revolution. 1990 : recording of the album Grand Mix, composed by Ris and Sauvageot, with the Philharmonic Orchestra of the Pays de Loire and with the Voix Bulgares. 1995 : the Festival of Roskilde (Denmark) discovers them as the support band of Jimmy Page and Robert Plant (Led Zeppelin). 2000 : Les Tambours du Bronx is acclaimed by Johnny Halliday’s audience under the Eiffel Tower. In November of the same year Les Tambours du Bronx invades American soil : from East to West the horde travels across the United States to give 38 wild performances in a 60-day tour. 2005 : the audience in Budapest applauds them as the support band of KoRn. 2006 : Les Tambours du Bronx galvanizes the Stade de France. 2007 : Les Tambours du Bronx joins forces with the Orchestra of the Laureates of the Conservatoire National Supérieur de Musique de Paris. The oil-drums also ring out at the Paris Zenith side by side with the Young Gods and Didier Wampas. 2008 : they create three tracks with Jaz Coleman (Killing Joke). 2009 : Les Frères Morvan and Les Tambours together sweep the audience off their feet at the festival Les Vieilles Charrues. 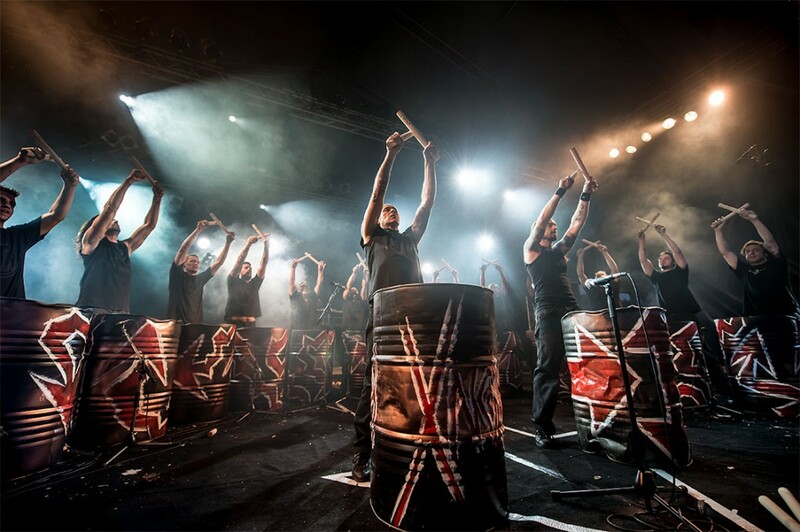 2011 : the oil-drums ring out in Brazil in a common show with Sepultura for the festival Rock in Rio. Metallica, for its part, only has to benefit from a heated over-excited audience. 2013 : again at Rock in Rio, the duo is resounding. 200,000 people waited for them for a deafening live. Their encounter was replayed in Times Square in September 2014. Today the musical synaesthesic upheaval caused by the fusion Sepultura/Tambours du Bronx is immortalized on their album Metal Veins, Alive at Rock in Rio.